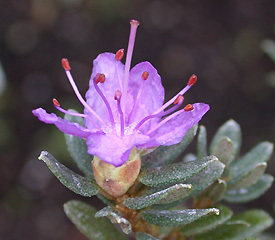 Funnel shaped, small, lavender-blue to rich purple, sometimes pinkish. Inflorescence 1-5 flowered. Leaves oblong to ovate, up to ¾" long, upper surface glaucous.